Ravenheat has added the brand new HE30S compact to its range of domestic gas boilers. The HE30S compact features the same quality components and single-coil stainless steel heat exchanger as its highly successful predecessor, the HE98S, as well as a brand new pipe configuration. It delivers 31kW to domestic hot water and has a flow rate of 12 litres a minute at a 35-degree rise. Ravenheat continued to incorporate feedback from heating engineers when designing and making the new HE30S compact. 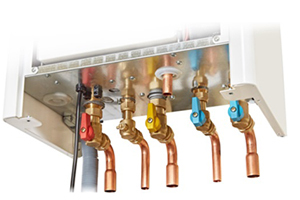 The revise d pipe configuration makes access and installations even easier with a colour-coded valve pack complete with copper tails. That means the pipes are 12mm away from the wall, so offsets for pipe clips are not required. The HE30S compact is good for customers, too, as the isolation valves are hidden from view by the front cover. 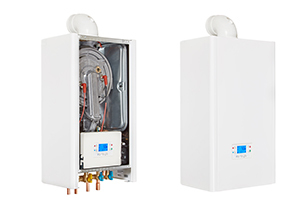 It’s compact by name and compact in nature, measuring just 700 x 400 x 265mm, so the boiler can fit into almost any space. Like the other products in Ravenheat’s HE range, it also features a high-resolution backlit LCD screen. The clear display screen makes it easy to see even in the darkest conditions, and it is simple for anyone to set the hot water temperature or view the system pressure. ​Ravenheat are committed to efficiency and making sure homeowners can access the best possible product, which is why they have made the HE30S compact with OpenTherm compatibility as standard. System efficiency can be increased by as much as 5%, if it is fitted with smart controls in line with Boiler Plus compliance. This will ultimately save end users money on their energy bills. The HE30S compact is built to exacting ISO 9001 standards and comes with a seven-year warranty. It’s available now from merchants across the UK. Ravenheat is an independent boiler manufacturer founded in 1987 and based in Morley, Leeds. The company runs training sessions and has research facilities at its Morley Head Office. The HE30S compact is a 31kW combination boiler that delivers 12 litres a minute at a 35-degree rise. It is compact in size, measuring just 700 x 400 x 265mm.